What does rent include at Identity Miami? Rent at Identity includes the benefits of a one-of-a-kind student housing just blocks from FIU and utilities like water, sewer, trash and electricity ($30 cap). You'll get access to cable, Wi-Fi, on-site maintenance, security, a long list of amazing amenities, and a fully-furnished apartment designed with you in mind! Perhaps most importantly, though, rent provides you the experience of living in an apartment building where you can meet new friends, make lasting memories and find your own Identity! What comes with an apartment at Identity Miami? What does “individual lease” mean? Signing an individual lease means that you won’t be responsible for anyone’s rent but your own! In a traditional apartment lease, all the residents living in a unit are required to collect the total rent amount and pay one lump sum. With individual leases, each student in the apartment can sign their own agreement and are only held responsible for their specific rent payment. At Identity Miami, we do not require cosigners to sign a lease. The only name on a lease is the resident. However, we do require a guarantor should the resident not have credit history or meet income requirements. Most residents do require a guarantor to financially agree to ensure timely payment of rental installments. A guarantor signs a guaranty agreement separate from the lease that payments are made on time. Usually a guarantor is a parent or guardian, but is not required. How do I qualify to lease an apartment as an International student? If you are an International student, simply select “International” on your online application. You will need to provide a copy of your passport and I-20 visa verifying student status, as well as pre-pay the last month’s rental installment in lieu of a qualifying guarantor. Are pets allowed at Identity Miami? Unfortunately, pets are not allowed at Identity. At our FIU student housing, we welcome all of our residents’ friends and family to Identity's community! We simply request that you check guests in at the front desk when they enter our building. In the interest of safety, we like to document everyone who is in our community. Is parking included at Identity Miami? Yes! Secured garage parking is available at Identity. However, we have limited spaces and they are filling up quickly already! Contact our leasing office to discuss leasing a parking space today! What kind of apartments are available at Identity Miami? Identity Miami has a variety of options when it comes to student apartments. One-bedroom junior, two, and four-bedroom options are available to residents along with a Studio Quad option. See all of our available floor plans here! What is a Studio Quad? 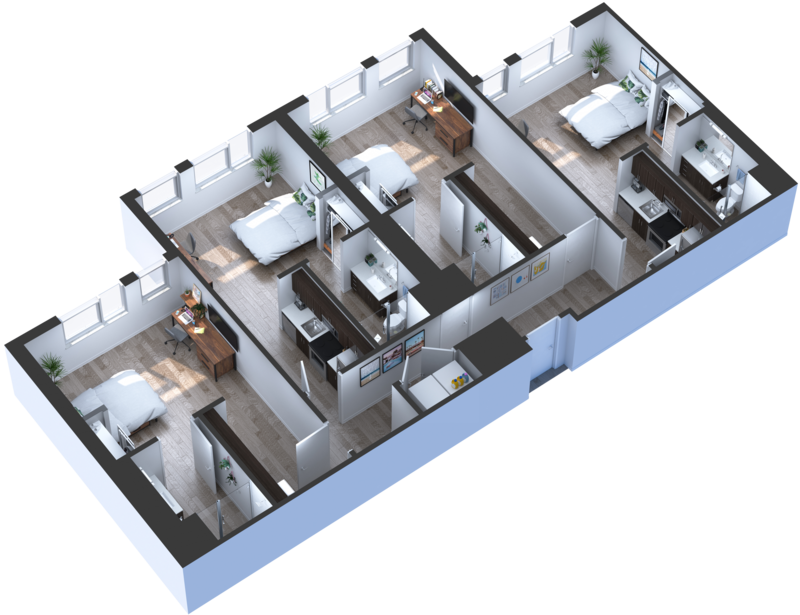 Studio Quads are one type of floor plan available at Identity Miami. Four studio apartments share a common corridor. Each individual studio has its own thermostat, a 50" SMART TV, stackable washer/dryer and micro-kitchen with stainless steel appliances! Studio Quads are great options for anyone looking for a place of their own with the added bonus of paying a little less than conventional studios and also getting to know the neighbors in your Quad! Be daring (try a new floor plan!) and stay true (to your budget!). When can I move into Identity Miami? Identity Miami’s doors are opening Fall of 2019! But that doesn’t mean you should wait to sign your lease! Spots are already filling up, so fill out an application today! How close is Identity Miami to campus? Identity is 3 blocks from Florida International University’s main campus. Located at the corner of SW 107th Avenue and SW 5th Street, our front doors are just blocks from class. But don't worry about getting to class--we have a shuttle to campus that stops right outside the front door! Absolutely! Through our Resident Portal, you can do everything from paying rent online to submitting maintenance requests! What type of security is available at Identity Miami? Our off-campus student housing community is a secure option for an apartment near FIU. Our state-of-the-art security system includes round-the-clock surveillance and electronic keycard access. We also have an on-site security guard and require all guests to check in at our front desk before entering our community. What types of amenities are at Identity Miami? Identity’s amenity package is unlike anything you’ll find in Sweetwater. We have everything from a resort-style pool to an ultramodern fitness & wellness center to study spaces—both public and private. Do you offer roommate matching at your FIU student housing? Yes! Looking at a unit, but don’t have enough people to fill it? Our proven system helps identify your ideal roommate(s)! We take into account things like your social habits, study habits, likes and dislikes, and we match you with people who share your schedule and lifestyle, and who you’re sure to get along with! Feel free to reach out to our leasing office for more details!